It’s somewhat peculiar to begin a tutorial for SketchUp with a prolonged discussion of a certain concept in image editing called masking. But without this clarification you might not quite understand why I set up my SketchUp models in a such a very specific manner. So what are we talking about? Masking was originally a traditional “analog” art technique. Most adults will discover that they are familiar with it, even if they have never used it for anything more elaborate than house-painting: if you cover some part of a wall with “masking tape” and then paint across the surface, on removal of the tape you will find that the area it had covered was (hopefully) protected from the paint subsequently applied to that wall. In the fine arts, including painting, photography, printing, and even ceramics, this basic technique has been refined and elaborated in a thousand specific ways, depending upon the medium and the exact degree of protection of the underlying surface that the artist needs. In the realm of raster image editors (in other words, with computer programs like Adobe Photoshop, Paint.NET, or GIMP and not for the most part with vector graphics editors such as Adobe Illustrator, Inkscape, Xara, or CorelDRAW), you create and use a mask for most practical purposes any time you select part of a digital image (by using in Photoshop, for instance, the Marquee Tool (M), the Magic Wand Tool (W), the Lasso Tool (L), or the Color Range dialog from the Select menu). Those little “crawling ants” that mark the edges of your selection also indicate the edges of the mask; the area of the image outside of your selection is protected, or masked, so that if you now (for instance) apply the Gaussian Blur filter (Filter>Blur>Gaussian Blur) those outside areas will not be subject to blurring. 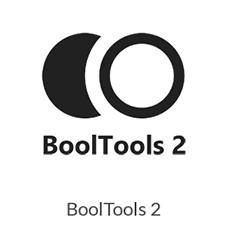 Notice, too, that while a selection is active in Photoshop, you can’t use tools like the Brush (B) or Stamp Tool (S) to color or change any part of the image outside of the selection. Once again: those areas are masked, and as long as they are not part of the selection you can’t mess with them. 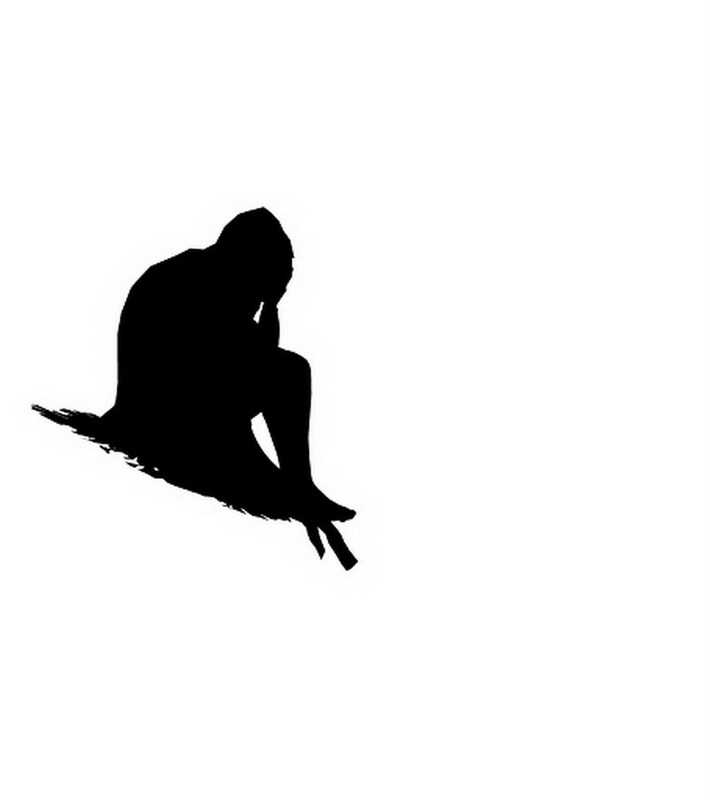 One more time: Whenever you select part of the image, the unselected parts are masked. 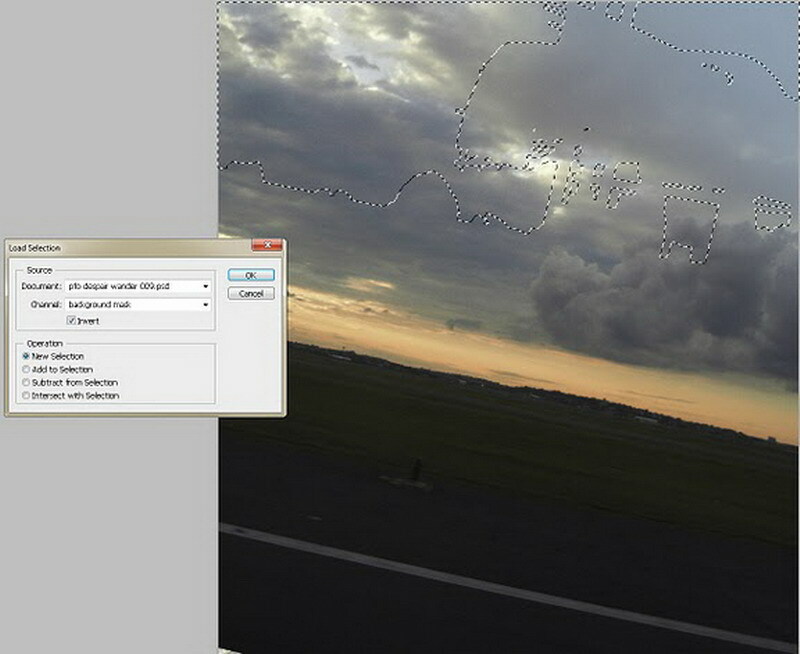 In Photoshop (and one way or another, in most other image editors) a selection, along with its attendant mask, can be thought of as an image itself (sometimes referred to as an alpha channel), with the same dimensions (height and width, in pixels) as the image to which it has been applied. 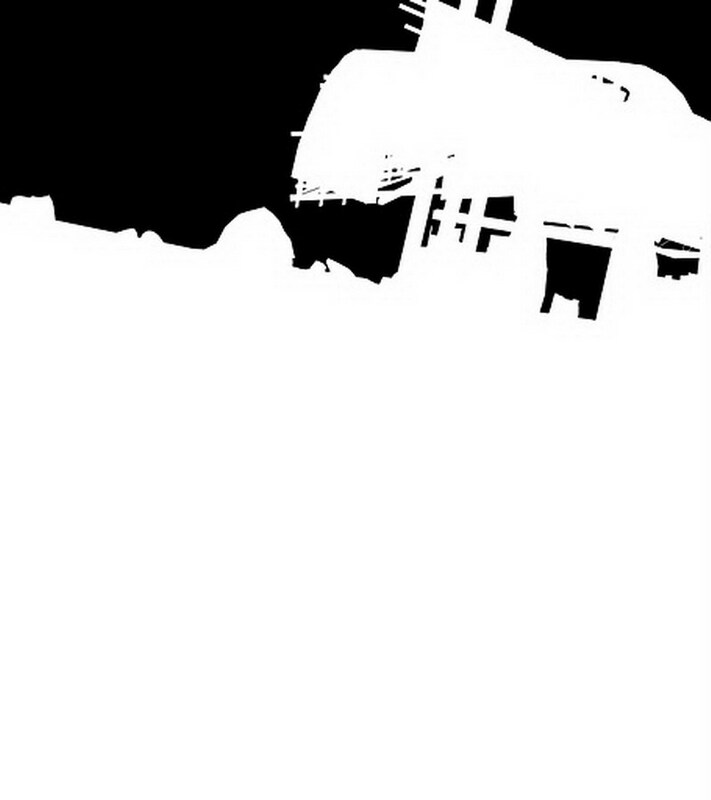 The idea is that the area of the alpha channel image representing the actual area selected in the original image is black; the area outside of the selection (the masked area) is white. If for some reason, areas of the original image are only partially selected, in the alpha channel these will be represented by shades of gray, with the lighter gray pixels in the alpha channel indicating less-selected areas in the original image and darker grays indicating more-selected areas. 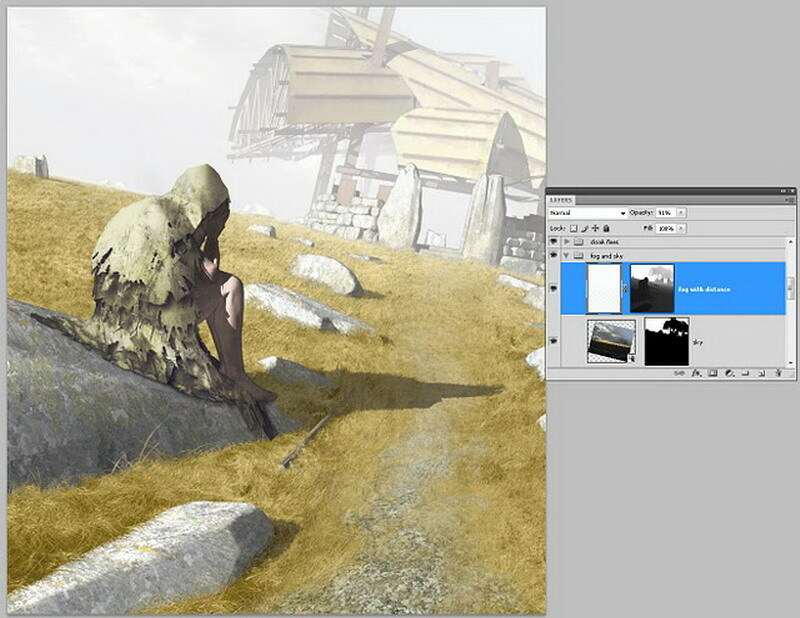 You can test this idea for yourself by opening up an image in Photoshop and selecting some part of it, say with the Marquee Tool (M). If you now open up Photoshop’s Channel window (Window>Channels), you will notice at the very bottom of the window a set of icons. If you hold your mouse cursor over the second one on the left (the one that looks like a white circle inside a gray square) you will see a “tool-tip” prompt reading, “Save selection as channel.” Left-click the icon, and notice that a channel named “Alpha” with some number affixed is now added below whatever standard color channels are listed in that window. If you single-left-click the icon for the new channel (or its name, which you can change to something more descriptive if you so choose) Photoshop will display the gray-scale channel in its main image window. Left-click the far-left icon at the bottom of the Channel window (tool-tip: “Load channel as selection”) to turn the channel back into an active selection. Then left-click the channel at the very top of the Channel window (it will be named something like “RGB”, “CMYK” or “Gray” depending upon the color nature of your original image) to see the original image in the main Photoshop window, with the newly-loaded selection ready for some Filter or Tool. You could also save a selection as a Channel by using the Selection menu (Select> Save selection) dialog in Photoshop and you could “load” or recreate a selection from a Channel using the Selection menu (Select>Load Selection) dialog. Interestingly enough, if you save a selection to a Channel using the Save Selection dialog in Photoshop, in the saved Channel the selected areas will be represented as white and the non-selected areas as black. It may be necessary, if you are recalling a selection from a Channel, to use the Selection menu (Select>Inverse) function to switch the selected areas to masked areas or vice versa. The key points to remember here: a selection implies the existence of a mask, and a mask can be saved and reloaded in a digital image (in some image file formats, most notably the .psd and .psb formats used by Photoshop natively) as an alpha channel. Alpha channels can also indicate other characteristics, like the part of an image that is transparent, but even with this sort of channel you could think of it as mask, specifically a transparency mask. 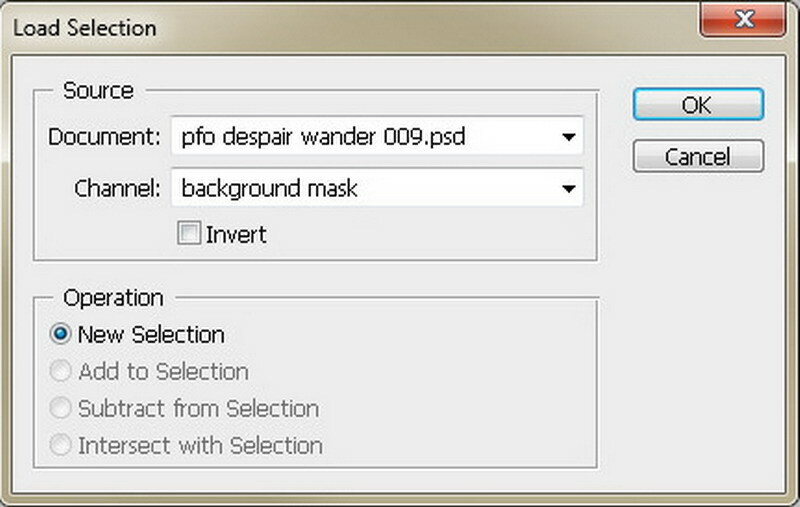 Another important type of mask in Photoshop (and in some other image editors, such as GIMP) is the layer mask. A layer mask is a a gray-scale image associated with a particular layer in Photoshop: where the layer mask is black, the layer is hidden, and where it is white the layer is visible. 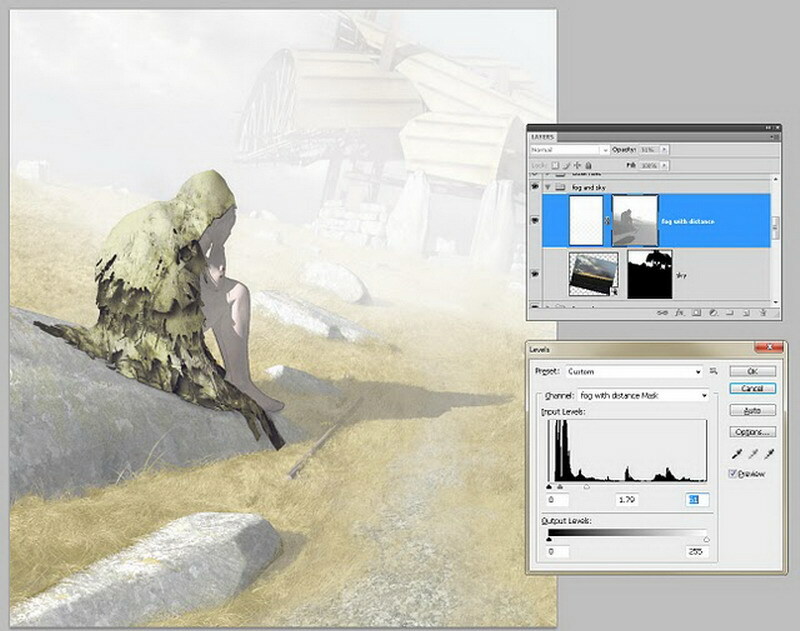 You can paint or otherwise modify a layer mask, and changing the distribution of white and black in the layer mask will change how much of the associated layer shows up in your image. So, now that you know what masking is, as far as a digital image is concerned, you are probably wondering what this has to do with SketchUp. SketchUp 2D exports are of course digital images, and as we all know in their fresh-out-of-model state they often leave something to be desired, in terms of general aesthetics. 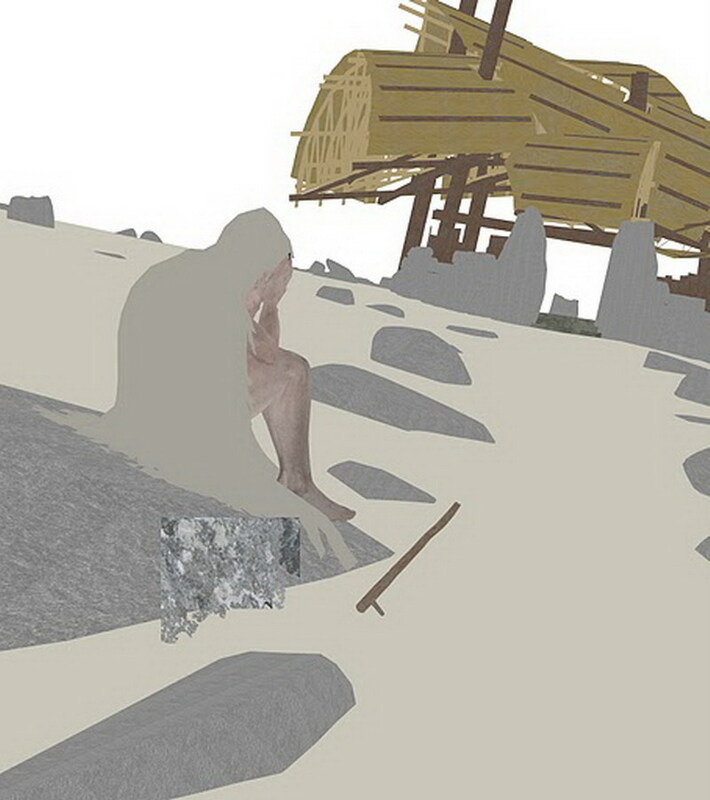 Often enough, I use the 2D output from a SketchUp model as simply the basis or skeleton for an elaborately worked-up, painterly illustration…the fixes (for the imperfections) and the over-the-top artistic stuff are all added with an image editor, usually with one or another edition of Photoshop (currently the long-in-the-tooth Photoshop CS4 Extended, because that is what I own, although I have applied the techniques discussed in this article while using GIMP and Paint.NET, less capable but free alternatives to the grand dame of the Adobe family). 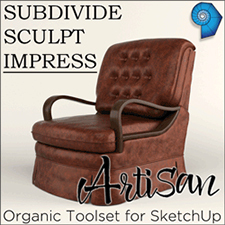 Actually, I tend to head towards Photoshop even if I use a rendering plug-in for SketchUp like Podium or Twilight to make a more “photorealistic” image of my model…there’s no rendering, in my opinion, that can’t do with a bit of post-production pixel-scrubbing. 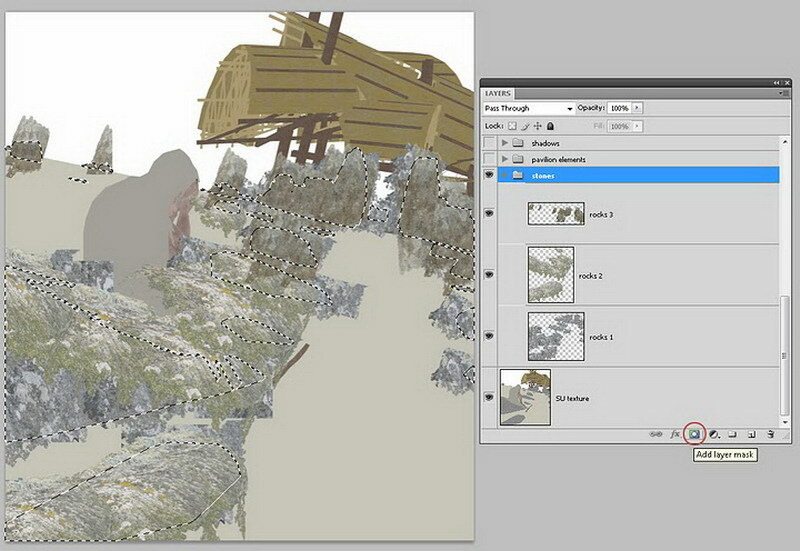 One of the most tedious problems with using Photoshop or a similar raster image editor is controlling the area affected by a tool or a filter, or making sure some part of a layer has just the right degree of transparency to reveal the desired portion of the layer “below.” Perhaps, in a given bit of 2D export from SketchUp, we have an entourage figure over to the side, and his cloak needs to be tinted a bit more green…or there’s a stone in the foreground that needs a realistically random pattern of moss which we can suggest with a creatively-configured brush and the Clone tool. Of course, one way or another we need to keep the parts of the image that don’t need those improvements from receiving them. We need masks, in other words. As noted above in the masking discussion, there exist in Photoshop (and similar applications) an array of ”Selection” tools that allow you to create as precise or as loose a selection (and therefore a mask) as you care. But these tools all have their limitations as far as precision is concerned; they make mistakes that must be corrected, when you set them to automatic in some way; and they always take up precious time. There is almost a Murphy’s Law effect here: the more urgent your deadline and the less time you have, the more you will need to zoom in to get that selection just right…the longer it will to make sure you have every pixel masked that must be masked and not a single one more…. 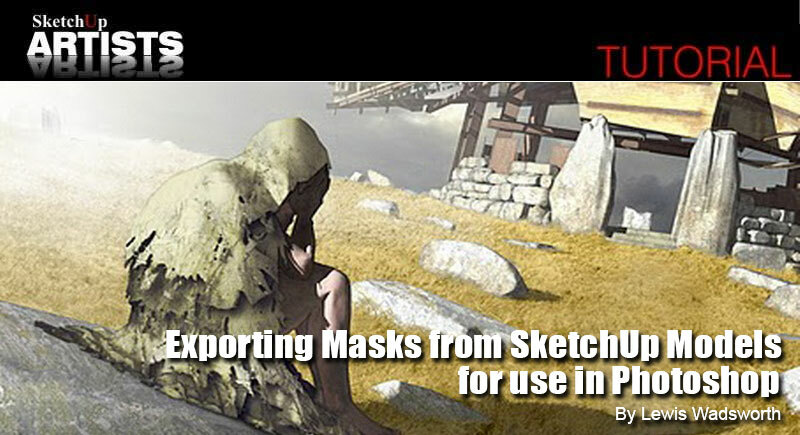 Obviously, it would be desirable to have as many of your masks as possible output from SketchUp directly, before you even begin post-processing your images. My entire modeling technique in SketchUp (and with other modeling applications, such as McNeel Rhino 3D, which permit a similar process) is predicated on generating masks, directly from the 3D model, that allow me to exactly limit the effects of tools and filters when I am ready to “go all artistic” on the 2D exports or renderings. Let’s formally introduce my example model here: in 2007 I received a small bit of distinction for this particular architectural design, and much was made of the painterly quality of the renderings that accompanied the original article in AIArchitect. 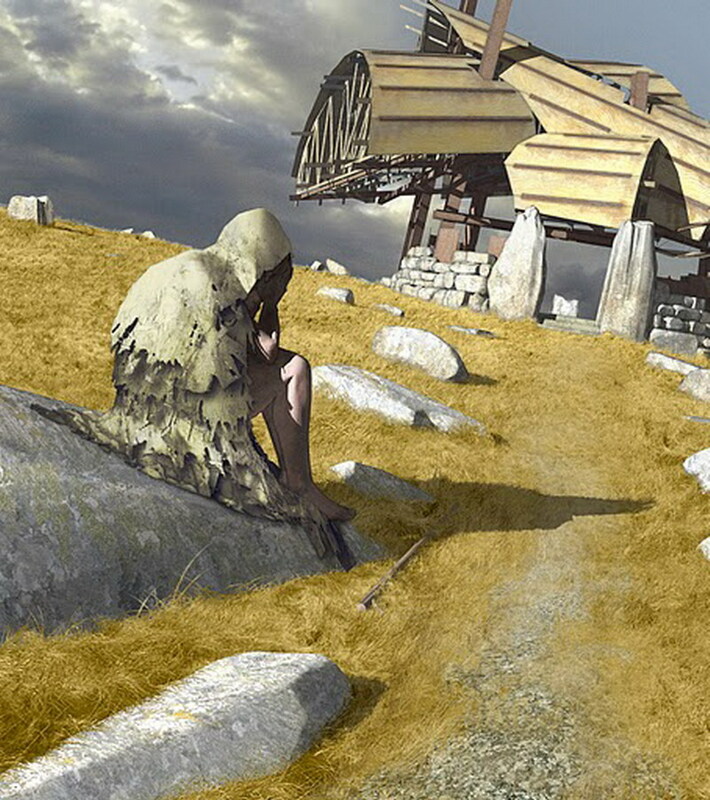 To illustrate this article for SketchUpArtists, I’ve added one element (a foreground figure, the Despairing Wanderer) to my Pavilion For Oblivion model. And for purposes of this exercise I’ve saved – in a carefully-labeled Scene (“CAMERA VF east”) – a camera view that is slightly different from those utilized for any of the published renderings of this project, along with a particular shadow setting covering the time of day and date. All 2D image output from the model will be sized to 2657 x 3000 pixels (that’s a multiple of the proportions an image will take, if I force Windows 7 to fit the main SketchUp application window in exactly half of the left monitor attached to my PC, and I set the height to 3000 pixels in the Export Image Options under Export 2D Graphic – but note that the images presented with this article have been re-sized for the Web). 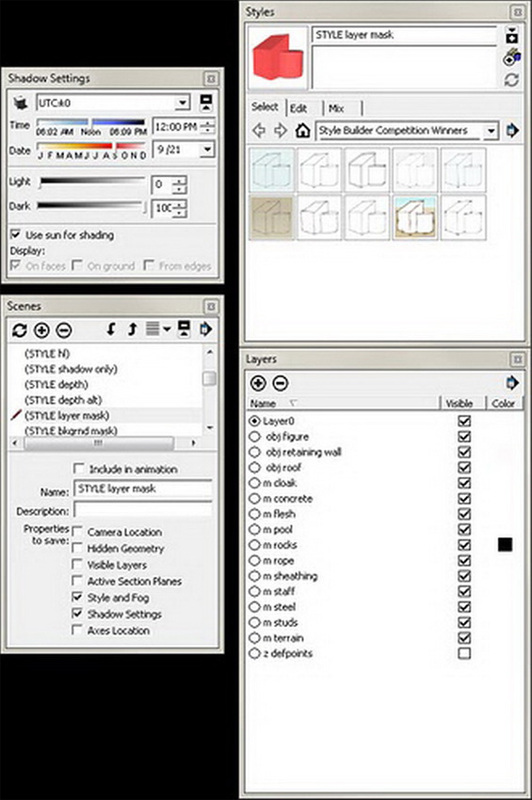 Here’s a screenshot of the my SketchUp application window, with the various display styles set as I usually have them while modeling. The SketchUp generated masks I will create are themselves straightforward 2D exports from the exact same camera position as the more conventional images to which I will apply them, with exactly the same pixel-dimensions. 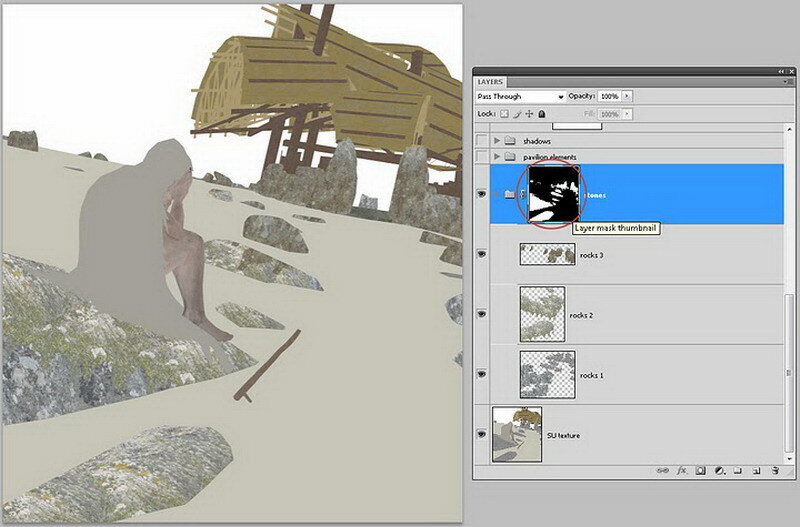 Usually, I apply a particular saved style to the model before I export a bitmap as a Photoshop-ready mask. 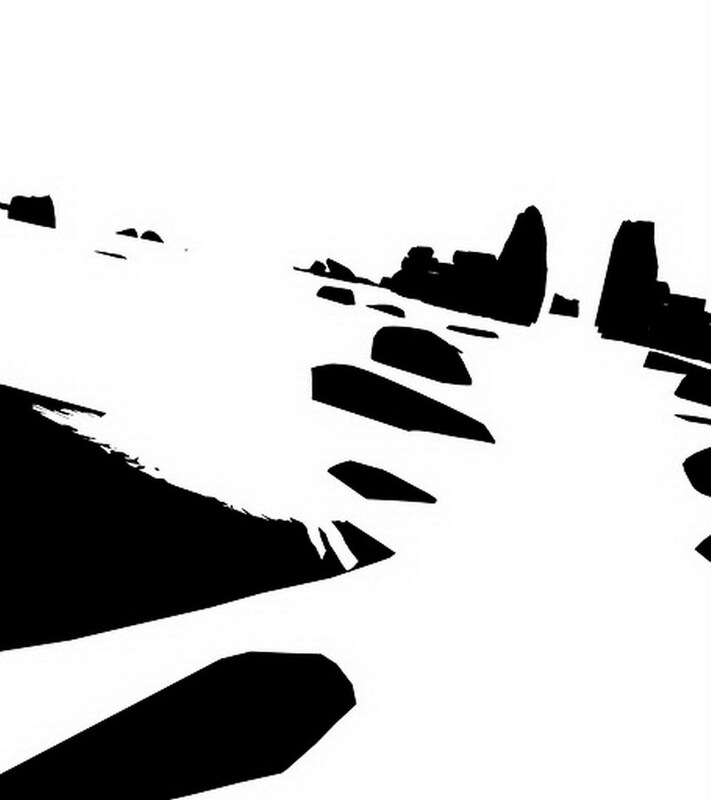 In addition, I need particular Shadow Settings (basically to eliminate shading) and potentially specific Fog Settings. 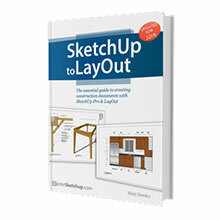 My default SketchUp template includes scene tabs that apply the appropriate styles and other settings to the model, so that I don’t constantly have to set and reset these to create the various image exports I need. The idea behind this pairing of materials and layers is to be able to temporarily over-ride all “real” material settings in favor of shades of gray useful an image-editing mask. 2. Masks that delimit the apparent extent of materials…for instance, a mask for the cloak, or the rock that needs moss. 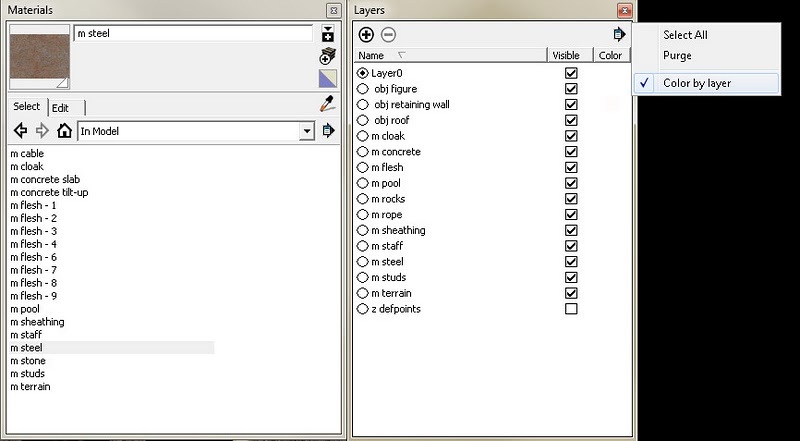 As noted above, all of these SketchUp layers that are paired with materials that currently exist in the model have their layer color set to white…except for the layer representing the surfaces with the materials I wish to mask. This layer’s color is set to black (RGB 0,0,0). Once again, in the Shadow Settings window, the “Light” slider must be all the way to the left (set to 0) and the “Dark” slider must be set all the way to “100″, with “Use sun for shading” checked to eliminate all shading in the model. I will probably, for a typical rendering, create a black and white mask for most materials used extensively in the model. 3. Masks for specific objects in the rendering…most of the time, this sort of mask is easy enough to create from material masks (category #2). 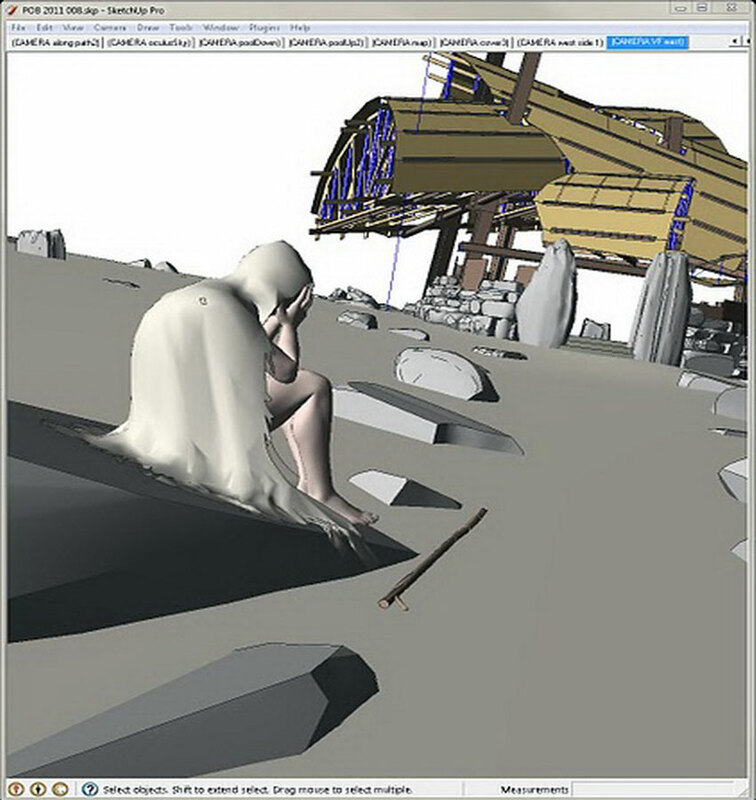 If I need a mask for the foreground figure, given the current configuration of the Pavilion model, I will do exactly the same thing that I did in #2, above, except that I will change the layer colors for both the layer representing the cloak material and the layer representing the figure’s flesh to black. However, in a model with a greater number of applied materials, where certain objects that I might wish to mask in a rendering share materials with other objects that I do not wish to mask, I might work up some other method, even if temporary, to move all of the geometry for that to-be-masked object to a single layer which I can color black while leaving all other layers in the model white. The goal is simply to have a black-and-white or gray-scale image that will make my task easier when I reach the image editing stage for the rendering. 4. 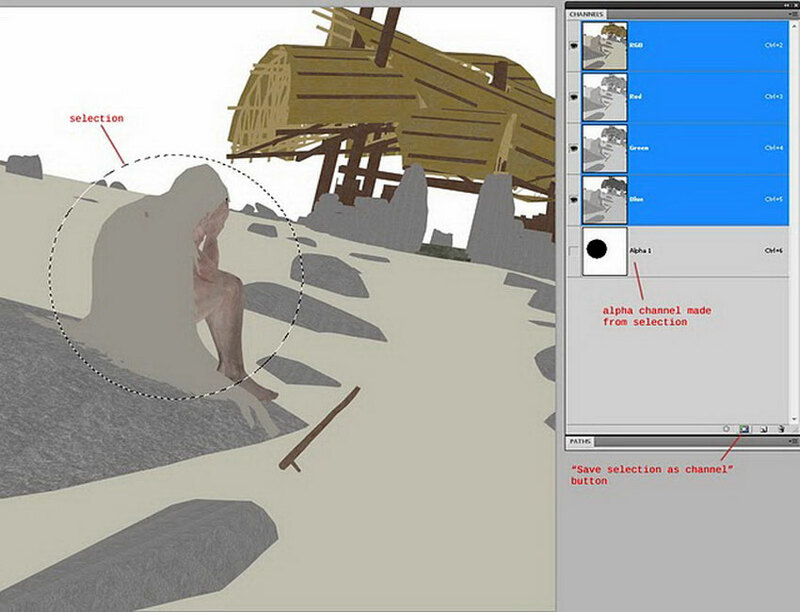 A mask that allows me to limit the effect of any tool or effect based on distance from the apparent point of view. This is what could is sometimes referred to as a depth mask. I use this sort of mask when I want objects in the distance to blur, as if they were beyond the camera’s “depth of field”, compared to objects in the foreground…or vice versa. I also use this when I want to simulate “atmospheric perspective”: the haze effect caused in the real world by atmospheric particulates like dust or vapor that cause objects to seem dimmer and more bluish-gray the farther away they are from us. 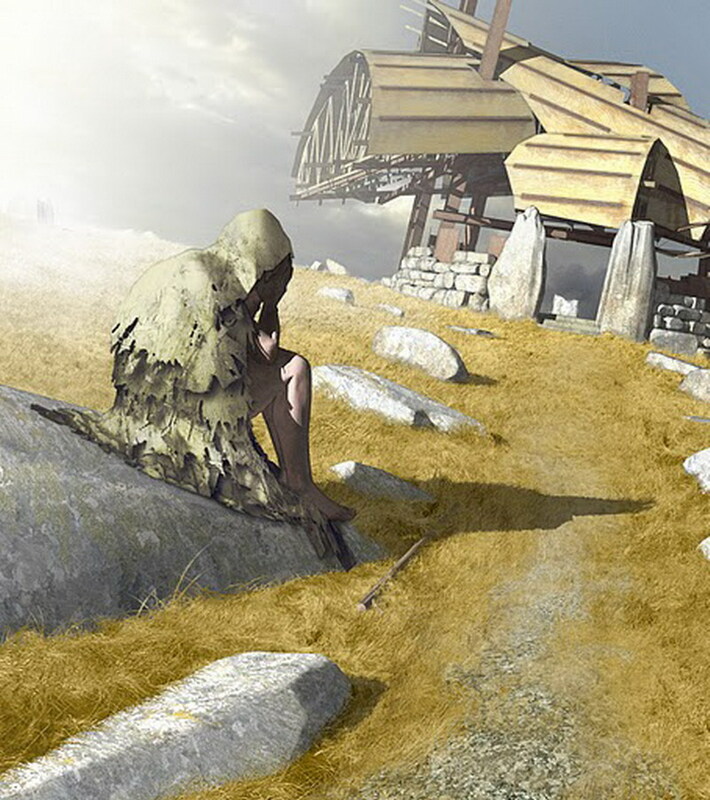 Fog or mist, more subtle and believable than the type generated by SketchUp’s Fog setting, is also easy to create using a depth mask. 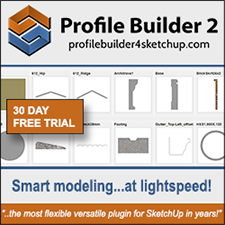 There are a couple of ways of creating a depth mask in SketchUp 8. For instance, I could take advantage of the “black fog” effect. 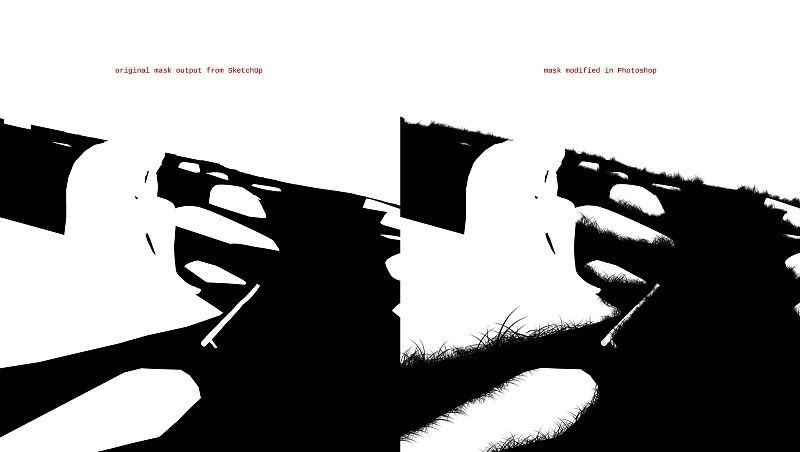 This involves a style setting almost identical to my “layer mask” style (#2, above). As above, in the Shadow Settings window the “Light” slider must be all the way to the left (set to 0) and the “Dark” slider must be set all the way to “100″, with “Use sun for shading” checked to eliminate all shading in the model. All Layers have their colors set to white. (OR, if the my use of Color by Layers offends your near-religious sensibilities concerning the appropriate layer for faces and you just hate placing actual geometry on any layer other than the default, go back to the Face settings of the Styles window Edit tab, set the faces to “Display faces using all the same” and set both Front color and Back color to white). Layers representing transparent surfaces should probably be turned off. And then, in the Fog window, clear the “Use background color” box and set the fog color (by clicking the color swatch) to black (RGB 0,0,0). 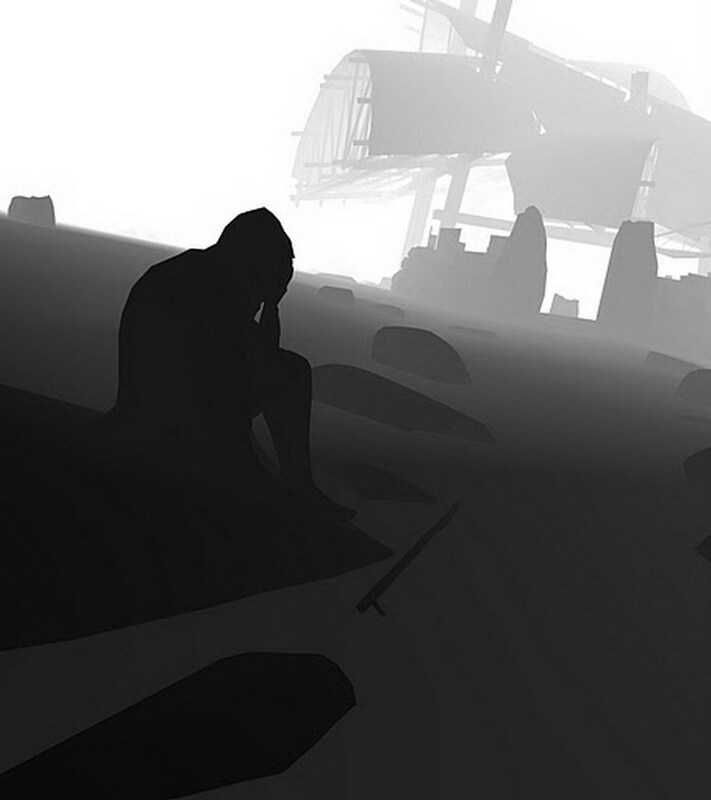 Adjust the “0%” and “100%” positions on the distance slider for fog until objects in the immediate foreground are white and the most distant important objects in your model are gray and barely visible against the black “distant fog.” Export this as the 2D depth mask. Notice some inconsistency in the depth mask above: the foreground “terrain” is not as white as the foreground boulder. In practice, when you use a depth mask for some effect in an image editor, these sorts of imperfections don’t seem to affect the final result much or at all. 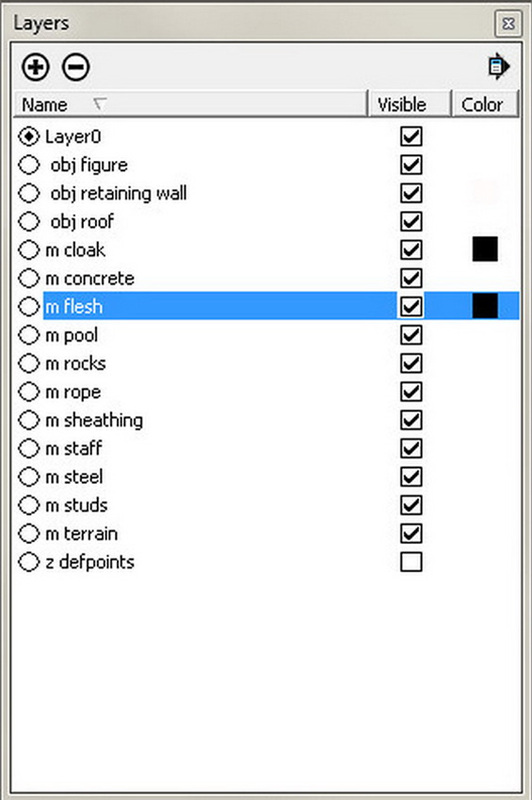 Incidentally, when you export a mask image of any sort from SketchUp, be aware of the setting of the “Anti-alias” check box in the Export Image Options window. If you want your masks to exactly…well, mask certain areas in your non-mask 2D exports, you should not check “Anti-alias” for any 2D export from the model, mask or non-mask ordinary image export. But I almost always do check the box myself, figuring that any slight misalignment between mask and masked caused by anti-aliasing is a small price to pay for otherwise higher-quality rendering output. So once, now that I have these “mask” image exports, how do I convert them into useful masks within an image editor? With your main rendering open in Photoshop, open (in another document) one of the black and white or gray-scale “mask images” you just made. Select everything (CTRL + A, on a PC) and copy it (CTRL + C, on a PC). 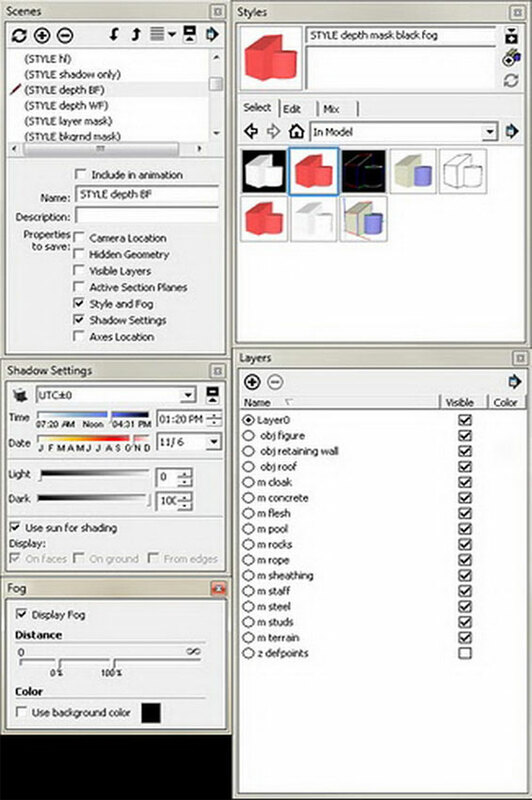 If you choose, you can now close the “mask image.” Switch to the main rendering document (the image to which you wish to apply the mask, in other words), open up the Channels window (Window>Channels), and at the very bottom of the window click the small icon to create a new channel, you will see the prompt “Create a new channel”. The new channel so created will be active and visible in the main Photoshop window…and completely black. 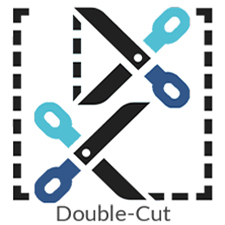 Paste the copied mask image into this new channel (CTRL + P, on a PC). Then double click the channel name to change Photoshop’s default “Alpha” tag to something useful like “rocks mask.” If you click the main composite channel at the top of the Channels window (which will be called RGB, or CMYK, or Gray, depending on your image type), Photoshop will make all active channels visible again. If an area is colored red in once you activate the main composite channel, it means you still have your newly-made mask active and visible (red was the traditional color of the masking material used in lithography), so look at the alpha channels (including the one you just made) and make sure the “eyeball” visibility symbol is cleared from the box to the left of the alpha channel name. To load one of these newly-made alpha channels as a mask or selection in you image, you can do one of two things in Photoshop. Remember finally that if you load a channel as a selection, and then you realize that the masked area should be the selected area and vice versa, you can choose Select menu > Inverse to switch them. It’s worth pointing out here that, although technically a mask is the area of a raster image that is not selected (as much belabored above), for most practical purpose during editing the distinction doesn’t matter very much. After I load a selection, I will regularly invert it, so that I can edit the area outside of the previously edited area without affecting my earlier work. So we have image masks and they are now save as channels in a Photoshop image, ready for loading as a selection…what next? That depends on the illustration project. 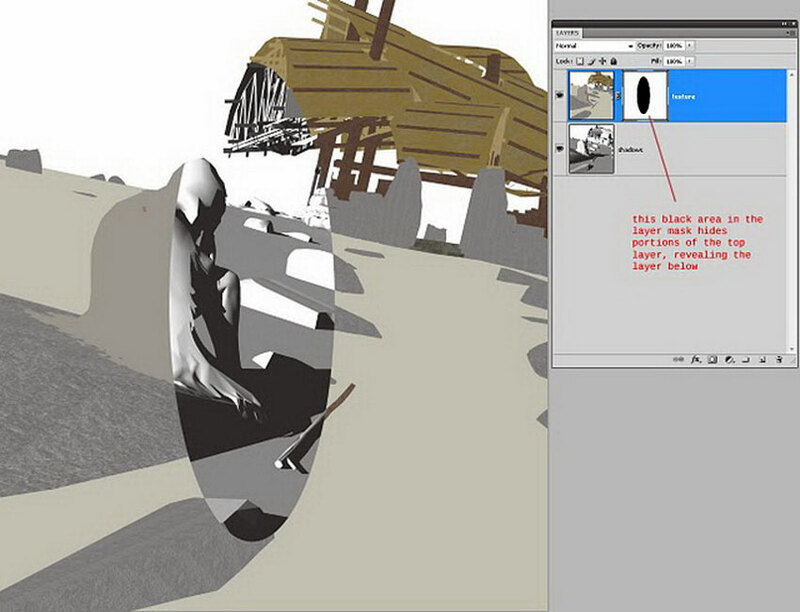 Let’s assume that, as an example, I want to give a better apparent texture to the boulders in my example scene. 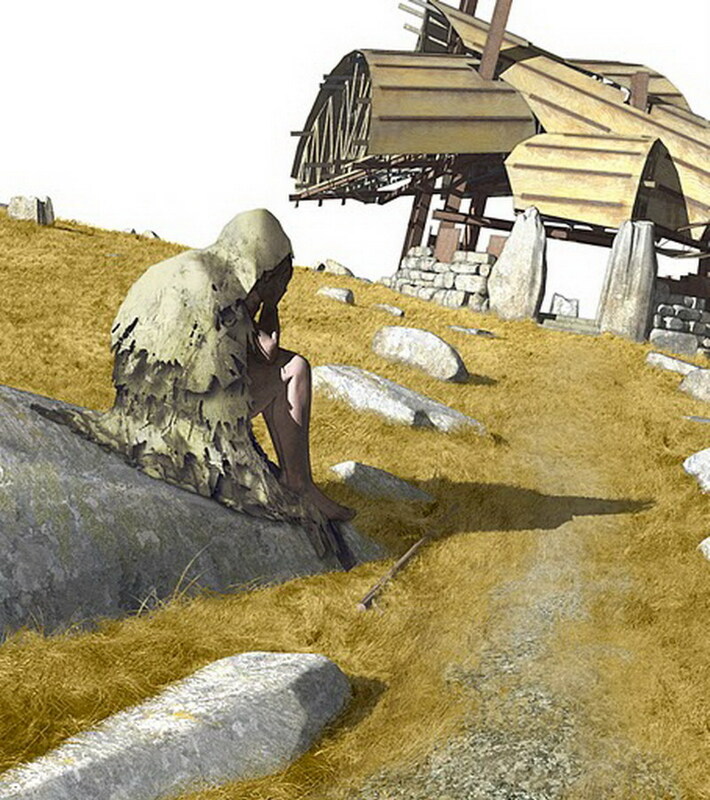 They have a very bland “concrete type” texture that I applied in SketchUp, but it’s just not satisfying my desolation-on-the-moors desire. I’ll copy some chunk of a suitably moss-begrimed rock-face image from my collection of such things, and I will paste it into my working Photoshop document (which already contains quite a few layers, consisting of various sorts of 2D imagery exported from the SketchUp model – a “shadows only” layer, a “hidden lines no shadows layer”, a “textured material only no shading” layer, etc. ), into a new layer, in a new layer group labeled, “rocks” or “stones” or something otherwise appropriate. Oh hell, let’s repeat this a few more times with bits of some other pictures of interesting rock surfaces. Enough. I’ll load the “rocks mask” I saved as a channel (and foresightedly renamed so I could find it in the list in the Select menu (Select> Load Selection). Note that I checked the box for Invert in the dialog. This is necessary because I am going to have Photoshop convert the selection/mask to a layer mask to hide the parts of my copied-and-pasted-and-copied rock surface bits. 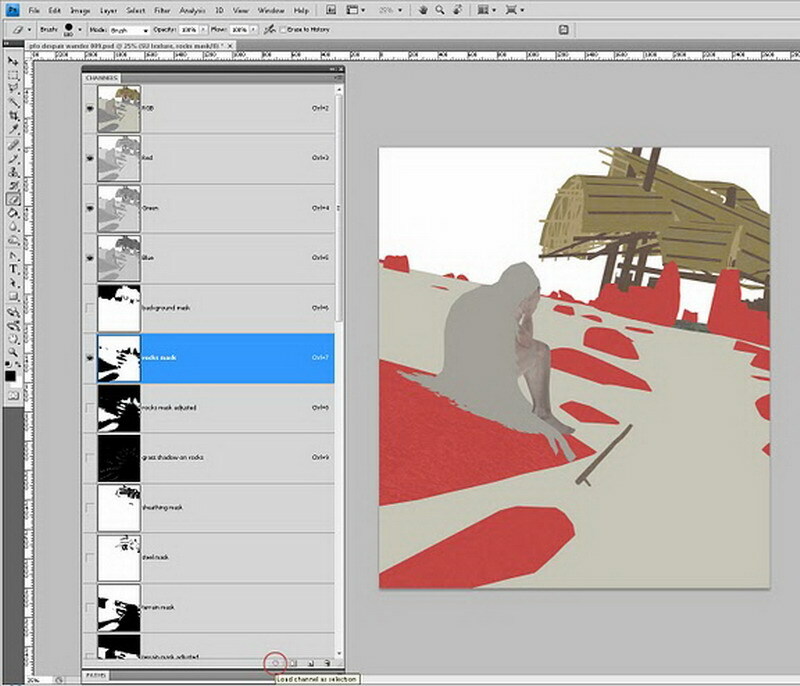 Click the “Add layer mask button” (a dark rectangle containing a light circle) at the bottom of the Layers window. Now I will use the full panoply of Photoshop sampling, filters, and layer tools to mix up, fade, and otherwise blend those rock surface samples so that they convincingly represent the sort of material I want for this scene, for these areas. And I’ll do this, again and again, for all of the areas in my image where the visible surface material needs this sort of robust treatment. 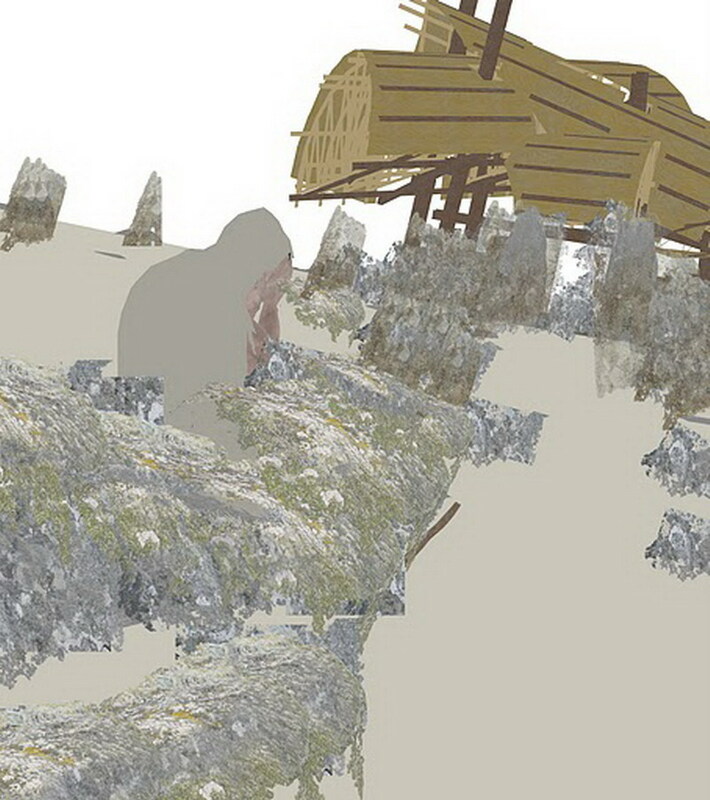 Note the grass in the next example image, and the gravel on the path. Notice the Despairing Traveler’s cloak! These textures were added in much the same way the rock textures were added to the boulders. And incidentally, once all of the various “materials” have their properly-masked textures limited by layer masks, I may actually go and chip away (paint) the layer masks so that the edges of the masks are not quite so clear-cut. Notice the blades of grass that poke up in front of the rocks, and around the staff on the ground. 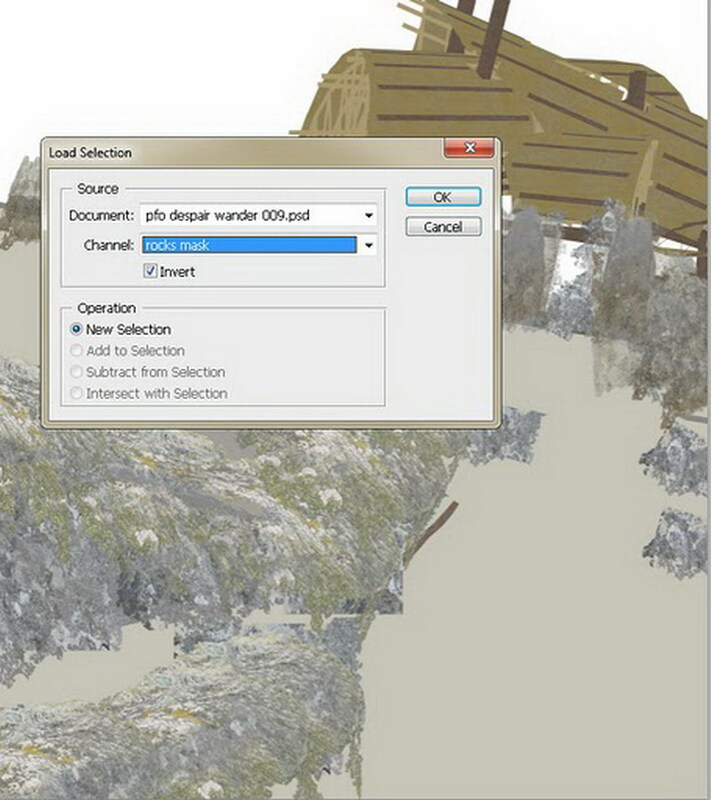 Compare the original terrain mask (left) with the adjusted terrain mask (right), below. I made somewhat similar modifications to the mask for the rocks…there are some Photoshop brushes that convincingly paint grass-blade-like shapes, and they can be used on layer masks and other gray-scale masks as well as full RGB images. Remember: if you use a brush or similar tool on a layer mask, areas that are painted white will reveal more of the layer; areas painted black will reveal less. What about that sky? I place one of my favorite sky photos (which I took through the window of an aircraft at Logan Airport once) above all the other layers, and load the (inverted) background mask originally output from the SketchUp model and saved as a channel in the Photoshop document. And then, with the new layer containing the sky hi-lighted in the Layers window, I once more hit the “Add layer mask” button at the bottom of the Layers window. I’m not quite happy about this, though, even after I tweak and blur the sky a bit. I want some mist, increasing with distance and merging with the firmament, but not really obscuring the pavilion in the top right of the image. 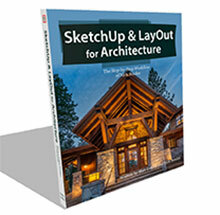 It’s one of my few published architectural designs, after all, and I’ll be damned if I make it difficult to discern. Are there actually meteorological effects that might account for what I have in mind? Who cares? I’m basically a recherché Symbolist painter who is just pretending to be an architect, anyway. So, I make a new layer above the sky layer and fill it with white color. I’ll scribble over it with the Eraser Tool (E) set to some low opacity and flow using a particularly grainy Photoshop brush, and I’ll decrease the whole layer’s opacity in the Layer window. 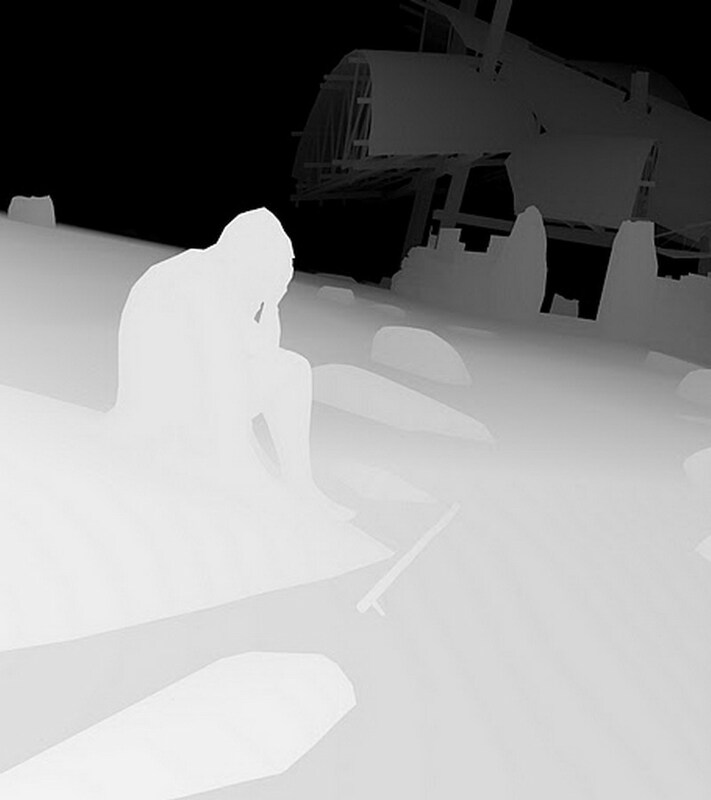 Then I’ll use Load Selection (Select>Load Selection) to load that depth mask (the white fog version) exported from the SketchUp model and saved as a channel as a selection, which I will convert to a layer mask for the fog layer. You should know this drill by now. So the fog is more pronounced with distance, but the progress from clear to misty is not as gradual as I would like, and my pavilion is obscured…so I will fuss with this quite a bit. 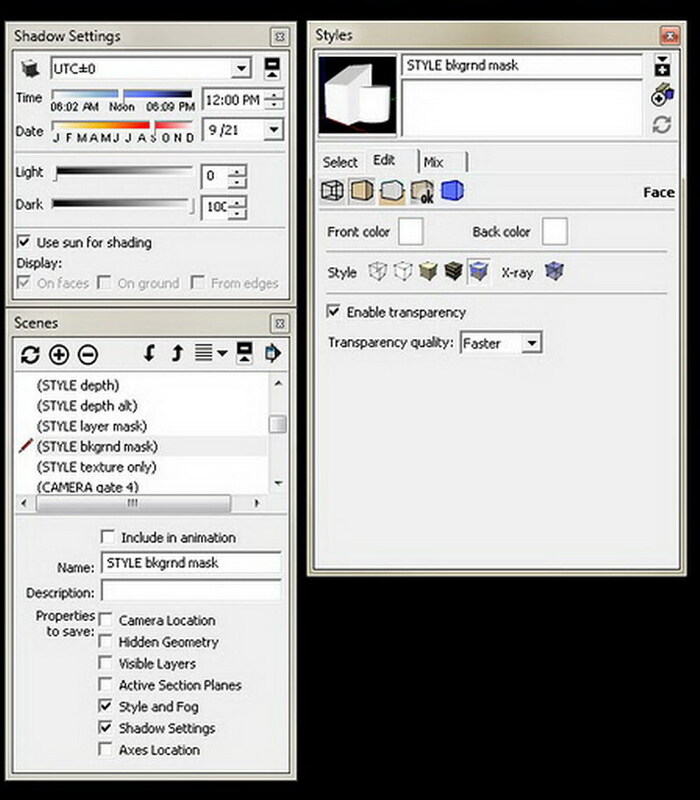 For instance, in Photoshop it is possible to select the layer mask in the Layers window and apply a filter or an adjustment to it, which only affects the mask and not to the associated layer. I use the Levels adjustment (Image > Adjustment > Levels) to change the contrast level of the actual mask, so that there is more gray (representing partially masked areas) and less black (masked areas) in the layer. …and so on, until I am satisfied with the location and amount of fogginess in the image. I will ultimately use Photoshop’s gradient tool to fade the right half of the fog layer mask to pure black, so that the fog doesn’t obscure the pavilion in the distance or the path to it. 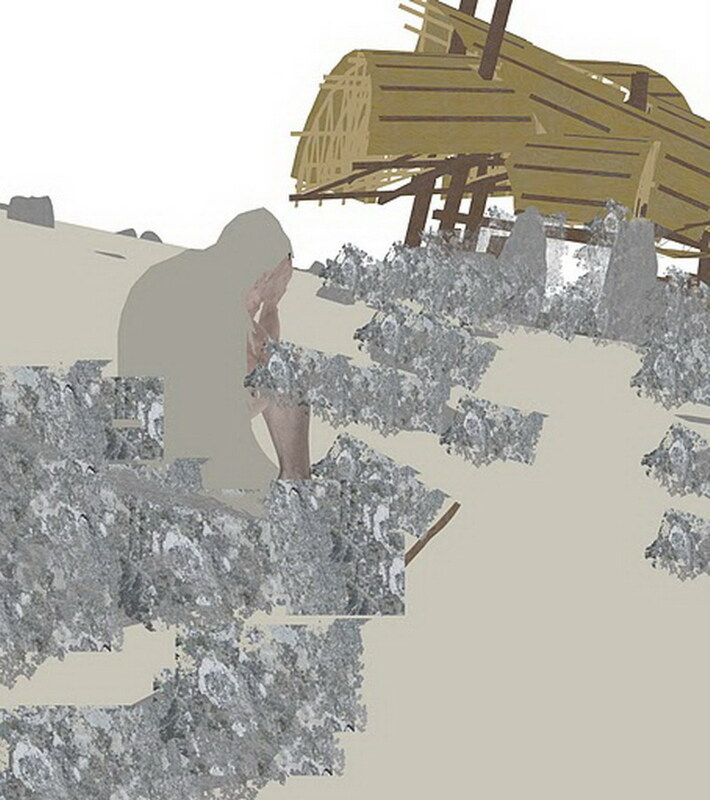 And I’ll use an “object mask” for the figure, extracted from the SketchUp model (see the example above) to paint an area of that fog layer mask black to create another spot in the image that is mist-free. 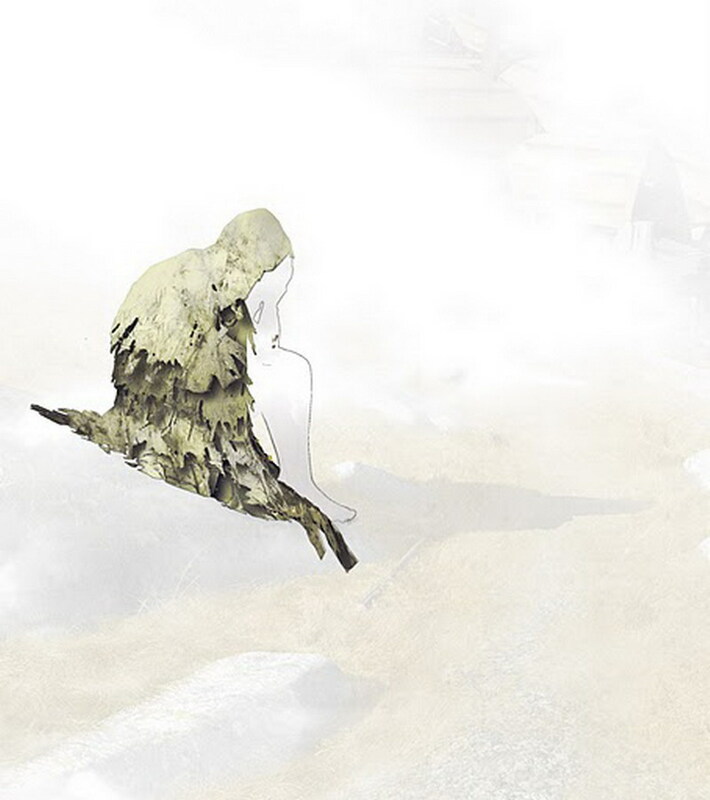 In the final version of this illustration, to achieve the effect I wanted I created a half-dozen “fog or mist” layers, each carefully masked and adjusted in terms of transparency and layer transfer styles. Well, that’s it. So much for my approach to modeling and rendering: I make my models to make masks. Masks. And more masks. One last note on this approach: it’s not for the impatient or the RAM-challenged. With all its layers merged, alpha channels deleted, and saved as a .png file, this 2657 x 3000 pixel illustration (we could call it, “Pavilion for Oblivion with Despair, 2011″) is a 16.2 megabyte file. But as a Photoshop document the image is comprised of thirty-seven layers with twenty-four alpha channels containing masks of various sorts, for a total file size (uncompressed) of 748.9 megabytes. And that is an increasingly typical working image file size for me. Excelente. Lo tengo que traducir con el google chrome pero aun así entiendo el concepto. Supongo que unas ves a que te acostumbras al trabajo de pos producción se vuelve divertido. What a great solution! I’ve been plagued by pixelated edges when cleaning up an exported image and it makes so much sense to essentially make the alpha mask in sketchup! Thanks for the great article!  I would just argue that if someone only wants to export a background mask (and no other interesting masks that you explain), they can just check the “Display shaded using all same” (with the front color set as white). That saves the hassle of turning all the layer colors into white, especially when one is using those colors extensively in their workflow. That said, this is a very cool tutorial, thanks!